A three storey retail building developed by Deramore Property Group. 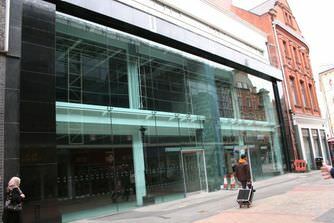 The building comprises two ground and mezzanine level retail units with storage space on the upper floor. The 11,500 ft2 building was designed by Milligan Reside & Larkin Architects and built by Gilbert Ash between August 2007 and June 2008. On completion the building remained vacant until Deramore announced in 2010 that the first unit (8,500ft2) would be let to Cotswold. In November 2010 the remaining unit was let to the Liverpool FC Official Store. Previously on this site was a three storey building built c1865. The building was considerably altered over time but five cast iron columns remained constant throughout the numerous alterations. The building was demolished during 2007 and the five cast iron columns were retained and can be seen as part of the new retail building. No. 11 Castle Lane operated as the Abercorn Restaurant from c1920 until c1990.